Food in this country is so abundant that we end up wasting about 40 percent of what’s produced — even when we clean our plates. Are you a member of the Clean Plate Club? Science says you probably are. A study published this year by Brian Wansink, director of the Cornell University Food and Brand Lab and author of the book “Mindless Eating,” found that the average adult eats 92 percent of what they put on their plate. The Clean Plate Club was a campaign started in 1917 after World War I and revived in 1947 after the Great Depression and World War II, times when the country’s food supply was limited. Historically, this makes sense, but today many parents still push their children to clean their plates even though it may set them up for a lifetime of eating when they aren’t hungry, and despite that, for most Americans, food is not scarce and portions are large. In fact, food in this country is so abundant that we end up wasting about 40 percent of what’s produced — even when we clean our plates. Waste happens at all points of the food chain: on the farm, during processing, at the grocer or farmers market, at restaurants and other food-service operations, and in our own kitchens. All while many people go hungry. In 2014, 14 percent of U.S. households were food-insecure. It’s ironic that we don’t want to let the food on our plates “go to waste,” even if we’re full, but we regularly waste food by letting it rot in the refrigerator or go stale in the pantry. Starving children in Africa — or here in Seattle — don’t benefit when someone else overeats. 1. Shop your pantry, fridge and freezer for foods that need to be used up, and plan meals around them. This also prevents you from buying more of what you already have. Remember that produce that’s looking a little tired is often fine for soups, casseroles, frittatas, stocks or smoothies. 2. Round out your meal plan based on how many meals you will be eating at home (or brown-bagging) that week, then use that plan to make your shopping list, buying only enough for the number of meals/servings you have planned. 3. Beware bulk and sale purchases. Buying in bulk doesn’t save money if you end up throwing half of it away. When you don’t have a plan for how and when you will use a sale item, it’s more likely to go to waste, erasing any savings. 4. Shop for how you actually cook and eat, not for how you fantasize about eating. Exotic or otherwise aspirational purchases often go to waste. 5. Follow through on your meal plan. 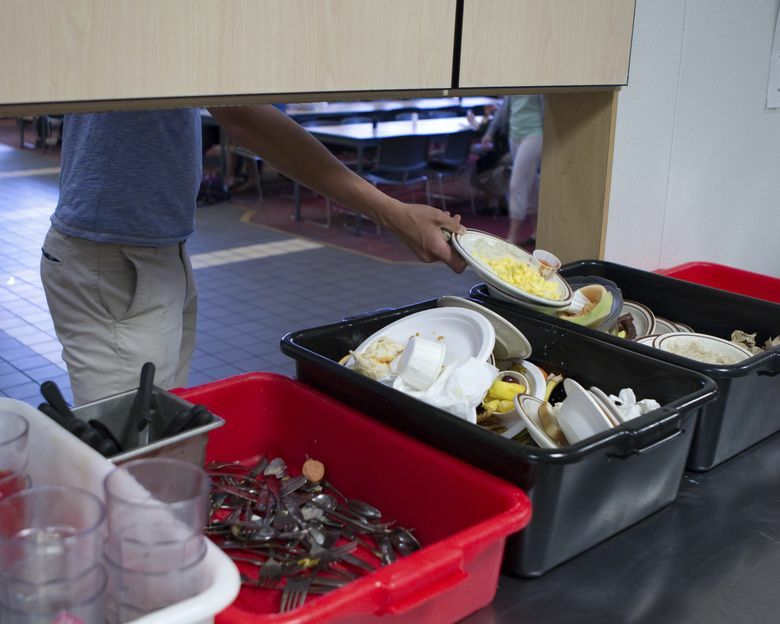 Impulse restaurant or takeout meals mean your groceries may end up unused — and unusable. 6. Plan an “eat the leftovers” night each week. 7. Wash, dry, chop and slice perishable produce and store in clear containers so you have them on hand for snacks and streamlined meal prep later in the week. 8. If you make a big batch of soup, chili or stew and know you won’t eat it all in a few days, freeze some in single-meal or single-serving portions ASAP (don’t let it sit in your fridge for several days first). Then, shop your freezer for “convenience” meals. 9. Keep in mind that “use by” and “best by” dates are not regulated terms (infant formula is an exception.) They aren’t related to whether the food is safe to eat. 10. If you have nutritious, safe, untouched food you won’t use, donate it to a food bank. 11. Compost food scraps or dispose of them in your food and yard waste rather than sending them to the landfill. 12. Don’t serve yourself more than what you think you need. Using a smaller plate or bowl is an easy trick to reduce portion size that really does work. If you still overshoot the mark, wrap up what’s left on your plate for later or toss it in the yard waste. Better to go to waste than to go to your waist.